The band told fans on Twitter that an announcement would be made later on Thursday. They did not give any details, but a video clip showed Sir Mick Jagger, Keith Richards, Ronnie Wood and Charlie Watts playing a blues song in a studio, alongside the message: “Coming October 6″. 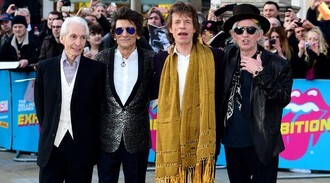 The band have not released a studio album since A Bigger Bang in 2005. The tweet came after US producer Don Was told French newspaper Le Figaro that the Stones had made an album of covers of Chicago blues classics. He said they recorded the album in just three days. “The record sounds very crude, very authentic. It captures the essence of what they are,” he was quoted as saying. Guitarist Eric Clapton is thought to be appearing on the new album. Stones guitarist Keith has said the band would be releasing an album which would feature “a lot of Chicago blues” and would be “coming out in the autumn some time”. On Friday, the Stones will play at Desert Trip, a new festival in California also featuring Sir Paul McCartney and Pink Floyd star Roger Waters.